Enabling Restriction (Parental Controls) is very useful for everyone who shares his or her iOS device with children. It is also capable of hiding some explicit online contents, lyrics, videos, and audios. Therefore, this feature helps you to lock some of the iPhone or iPad functionalities that are not suitable for younger viewers or any other person using your device. Before Restrictions can be enabled on an iOS device, you’ll need to create a 4-digit passcode, which would prevent anyone from changing the restriction settings on your device. However, if you forget the restriction passcode, you won’t be able to disable restrictions on your device. Therefore, we shall be discussing what is enabling Restriction, the use of Restriction in the iOS device, and how to disable Restriction without a passcode. Part 1: What Does “Enable Restrictions” Mean? Part 2: What is the Use of Restrictions? What Does “Enable Restrictions” Mean? The use of Content & Privacy Restriction in Screen Time is to block or limit specific apps and features on your child’s iOS device. More so, enabling restricting the settings on your iPhone or iPad would prevent you from accessing explicit contents, purchases, downloads, etc. What is the Use of Restrictions? If you’re a parent or guardian of children who use Apple devices, you can setup Content and Privacy Restrict to stop or monitor the contents they use in the device. Step 1. Go to “Settings > Screen Time > Continue”. Step 2. Choose between “This is My [Device]" or "This is My Child's [Device]”. Follow the appropriate prompts to complete this step and create the passcode. Step 3. Click “Content & Privacy Restriction”, enter your Passcode, and turn on the switch. You can prevent your child or ward from installing or deleting apps, make in-app purchases, or more on an iPhone or iPad through Restriction. Step 1. Go to “Settings > Screen Time > Content & Privacy Restriction”. Step 2. If it is necessary, enter your password, and click “iTunes & App Store Purchases”. Step 3. Set to “Don’t Allow”. It’s possible to restrict explicit content and content ratings on your children’s iOS device. You can also prevent the playback of music with explicit content such as movies, TV shows with specific ratings, audio files, etc. Step 1. Go to “Settings > Screen Time > Content & Privacy Restriction > Content Restrictions”. The benefits you can derive from using Content & Privacy Restrictions are numerous, but you won’t be happy if you can’t disable restriction on your iOS device. There are numerous reasons why you may not be able to disable restriction on your device, and some of them include buying an iOS device with Restriction enabled, friends or family member setting up the restriction on your device, or you forgot the restriction passcode. In all these scenarios, iMyFone LockWipercan assist you in removing Content & Privacy Restriction passcode from your iPhone without iTunes. It enabled you to remove all iPhone passcode, iCloud Passwords, and other restrictions from your iOS device. With LockWiper, all you need is to follow a 3-step guide in removing Restriction from your iPhone. Disable Content & Privacy Restriction on iPhone, iPad or iPod touch. Removes all iOS locks from iOS devices in few clicks. Unlocks all iPad or iPhone screen locks even 4-digit & 6-digit passcodes, Touch ID and Face ID. Very efficient in removing Apple ID and iCloud account from the iOS device. Step 1. 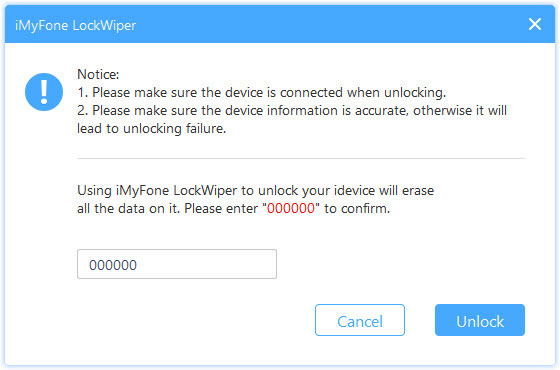 Launch iMyFone LockWiper on your computer and select “Unlock Screen Passcode”. Then, click “Start” to begin the process. Step 2. 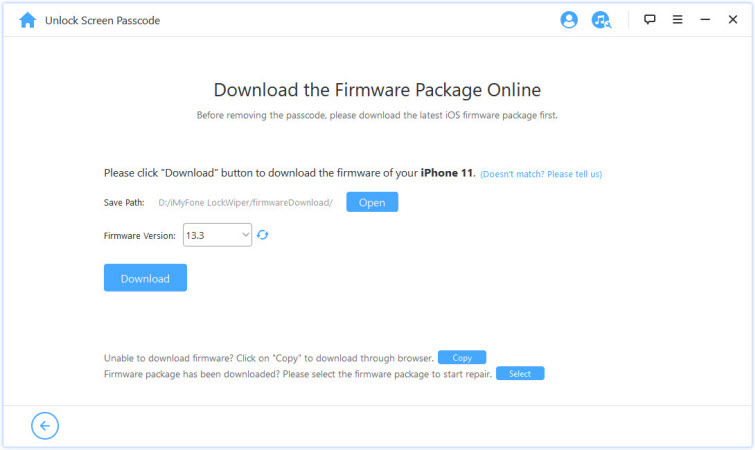 Click the “Download” tab to get the firmware package for your device. When the download and verification process is over, click “Start to Extract”. Step 3. Click “Start Unlock”, enter “000000” into the box, and click “Unlock” to remove the Restriction code on your device.